Wellness hotel with dreamlike view over the Dolomites, excellent regeneration offer & exquisite cuisine. 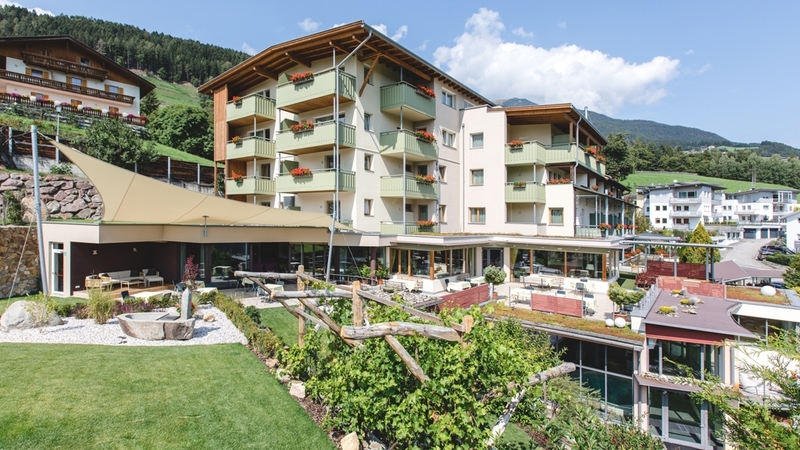 Welcome to our Panorama Wellness Hotel Feldthurnerhof ***s in Feldthurns! Thanks to the well-kept, familiar atmosphere, our hotel is the ideal holiday home from families, groups of friends or single travellers. Relax in our new “Panorama wellness” spa oasis with Alpine hut sauna (outdoor sauna), herbal steam bath, mountain pine bio sauna, relaxation rooms, water beds, massage whirlpool, indoor pool with sunbathing lawn and beauty farm, in our wonderful garden and in our new well-being rooms that are furnished with all comforts of a 4-star hotel. Relax on our new sun terrace with fantastic panoramic view of Eisacktal and the Dolomites. In our panoramic restaurant, you can enjoy excellent, local and regional dishes. Our Hotel Feldthurnerhof is located on the sunny plateau of Feldthurns. Right at the doorstep of our house, you will find numerous hiking, walking and Nordic walking trail for any season. As well, we offer guides hikes and guided snowshoe hikes and tobogganing excursions in winter. As well, Feldthurnerhof is a good starting point for visiting the cities of Brixen and Klausen, for circular tours and cultural excursions. In winter, you can quickly reach several ski resorts such as Plose, Gröden, Obereggen, Mt. Kronplatz or Seiser Alm. We will be pleased to welcome you in our oasis of well-being! Big single room "Königanger" (approx. 16 m²), with shower and toilett, fon, TV (german and italian), phone, safe in the room and balcony. Big double room "Dolomiti" (approx. 25 m²), with shower and toilett, fon, TV (german and italian), phone, safe in the room and balcony with a very good view to the dolomites. Double room "Königanger" (approx 20 m²), with shower and toilett, fon, TV (german and italian), phone, safe in the room and balcony. Double room "Königanger superior" (approx. 25 m²), with shower and toilett, fon, bidet, TV (german and italian), phone, safe in the room, seating area and balcony. Familysuite (approx. 54 m²), with 2 bedrooms, everyone with shower and toilett, fon, makeup mirror, bidet, TV (german and italian), phone, safe in the room and balcony. 1 room with separate living area, minibar and balcony with panoramic view of the Dolomites. With shower and toilett, fon, makeup mirror, bidet, TV (german and italian), phone, safe in the room, cozy seating area, small fridge and balcony with panoramic view of the Dolomites. Suite "Geisler" (approx. 40 m²), with shower, fon, makeup mirror, separate toilett/bidet, living room with sitting area, TV (german and italian), phone, safe in the room, small fridge and separate bedroom with TV (german and italian) and balcony with panoramic view on the Dolomites.